In today’s Era internet have a very deep impact on the people, now a day’s people spend more and more time on internet rather than in library for getting quick study information or any other information. Blogging have made livings for the people, Blogging have been a crucial source of income for many house-wife’s, retired teachers, students and for many other people. Many People think that blogging is just a waste of time and nothing more! But it’s not true at all. There are many possible careers in blogging as in any study course. 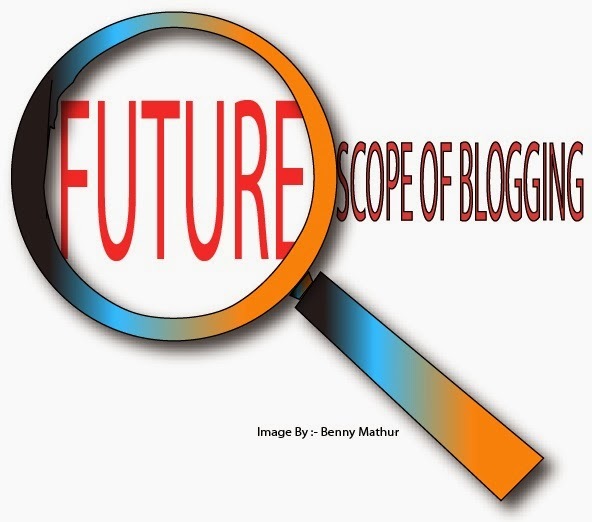 For Understanding the future scope in blogging let’s have a look at current political figures as well as every big newspaper. Now a days there is a whole department of people involved in making and handling blogs for all big Politian and newspapers such a Danik Bhasker , The Hitavada and may other newspaper also have a group of people for maintains and keeping their website up-to-date. Now a day over 500 companies are looking for authors and writer for their blog. There are companies, which are in search for experienced writers to keep their blog updated. On these company sites, the authors can publish alongside the companies book-keeping and management placements, other various topics. Yes defiantly, there is earning in this type of jobs relating to website management and blogging. Many companies now a day are hiring more and more people to run blogs on behalf of their company and promote their products. The best example is “Affiliate Marketing” guess you have heard of that! If not, Affiliate marketing is the process most of the company adapt to grow their business by promoting their products via different blogs, here you come into the picture, a blogger , there are so many affiliating websites searching for blog owners to join them and start promoting their affiliated products via their blogs. The earning is simple, you get 5-10% of the product sales. You might be thinking that’s too low right, but if you try to mange a lot of traffic on your blog then its guaranteed that you will make more sales and will make more money even than of jobs. There are many well know companies who offer jobs for the bloggers for writing promotional articles, promoting their companies name and product via a blog. These companies pay a blogger well enough as any other people earning in a job. As blogging in itself have a vast area of covering, blogging opens you a large number of jobs opportunities that you can pressure no matter from which study field you belong to. Here are some Job types that you can look into if you are already a blogger and have a good command on English and grammar. These are Top 5 job that you can pursue in the field of blogging. The income is high and these are far more relaxing jobs then desk jobs in companies. For concluding my saying, Blogging have a non-retirement career to work with, you can blog as long as you like.